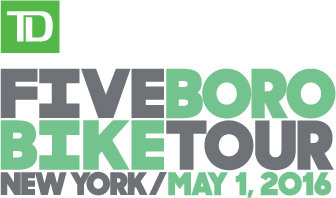 The 39th Annual TD Five Boro Bike Tour will take place on Sunday, May 1, 2016. Registration for the 2016 Tour will open on January 12th, 2016 at 10:00AM. On the first Sunday in May, 32,000 cyclists of all skill levels come from around the world to roll through every borough of New York City on streets totally free of cars. For one day, the roads are yours, the bridges are yours, the City is yours—there’s no better way to experience the Big Apple. Produced in conjunction with the City of New York, the TD Five Boro Bike Tour is the largest charitable bike ride in the U.S., with proceeds funding our free bike education programs. In 2014 alone, we taught bike skills to more than 16,000 kids and adults. When you ride with Bike New York, you’re helping us in our mission to empower more New Yorkers to grab life by the handlebars. The price for Standard Registration is $92 (plus processing fees), $22 of which is a tax-deductible charitable donation. VIP Registration is $325 (plus processing fees), $76.50 of which is a tax-deductible charitable donation. All Tour fees are nonrefundable, non-deferrable, and nontransferable. Tour fees are subject to change from year to year. Bag Restrictions: No bags with shoulder straps (including backpacks and hydration packs), no panniers or bags that hang on the side of your bike, no covered baskets, and no bags over 420 cubic inches (6.9 liters). Packet Pick-Up: All cyclists must pick up their rider packets at Bike Expo New York (April 29-30, 2016). To find out more information, visit bike.nyc.